Figure 1. Experimental insect rearing chamber used in the BioServe Space Technologies Lab. Two newly emerged monarchs and one pupa can be seen. The left side has the compartments for diet. The red circle is the "flower" of the nectar feeder. Photo by Stefanie Countryman and Ryan Horn. Figure 2. A view of the entire insect rearing chamber. Note the LED light fixture on the top of the chamber. Photo by Stefanie Countryman and Ryan Horn. Figure 3. 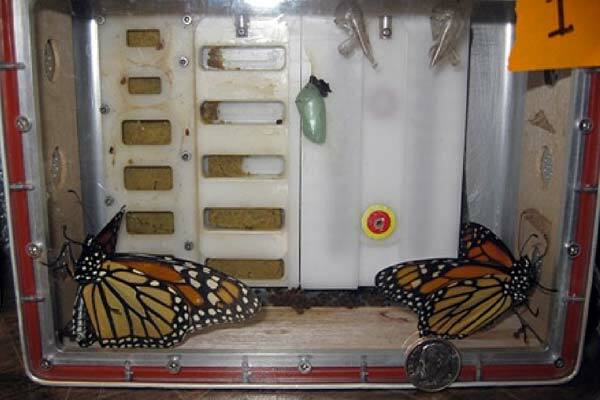 A view of the rearing chamber supplied by BioServe Space Technologies to select schools participating in Monarchs in Space "Plan A". Photo by Stefanie Countryman and Ryan Horn. The rearing chamber BioServe Space Technologies supplies to the limited number of cooperating schools in their program is shown in Figure 3. The first 20 schools that responded to our request for cooperating schools will receive this kit from BioServe and carry out "Plan A". Those of you participating in "Plan B" will be creating your own rearing chambers. We will provide directions for some alternatives; however, we welcome your input and if you come up with a better idea, please share your creativity with the rest of us via the Monarchs in Space Forum. It should be approximately the same size as the one shown in Figure 3 (7" x 5" x 3.5"). 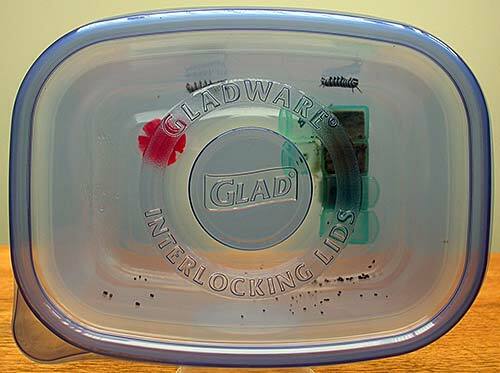 There are many suitable substitutes for the clear plastic container such as food storage containers, clamshell containers of the sort found at salad bars, etc. 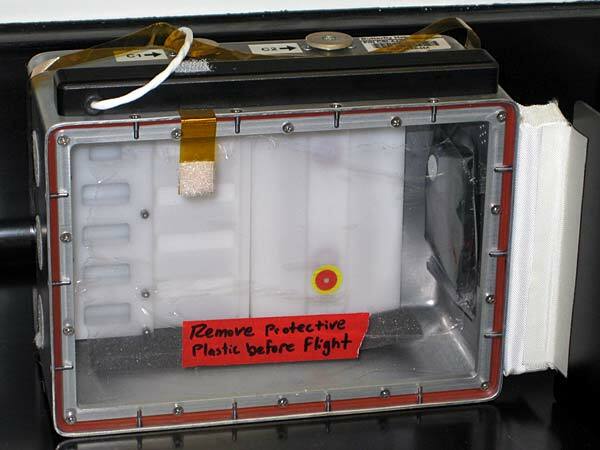 The diet trays should be arranged vertically and within half an inch of the top of the chamber as shown in Figure 3. You can buy pill organizers of the type shown in Figure 3 or you can use caps from soda bottles or other small containers. Be sure these containers are clean before adding the diet and gluing them into the chamber. Do not place the diet trays at the bottom of the chamber. 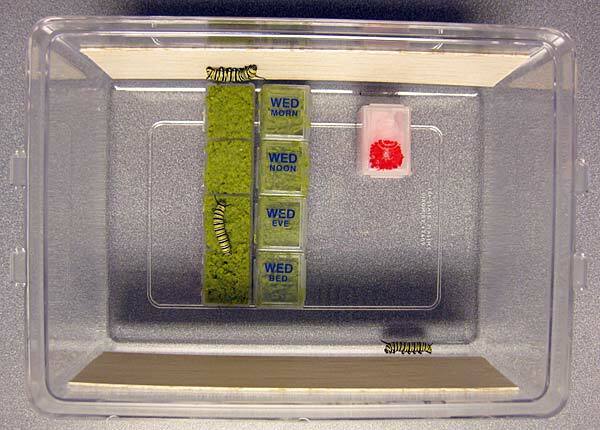 Monarch caterpillars are strongly negatively geotaxic – they go up and don’t like to go down, even for some chow. 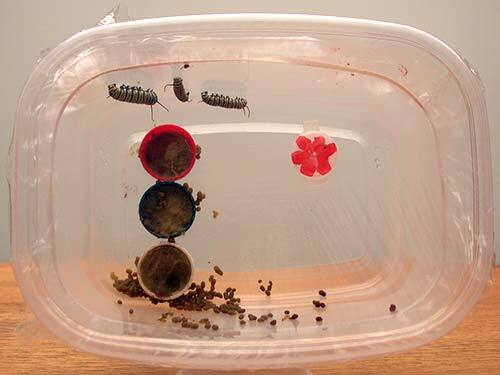 The top of the chamber should have a relatively rough surface so that the caterpillars can attach a bed of silk on which to form the chrysalis. You can use balsa wood, sandpaper, fiberglass screen, cloth, etc., but whatever you glue or affix to this surface should be clean or cleaned before you place it into the chamber. Do not use cardboard, paper, or other smooth materials for the top of the chamber. 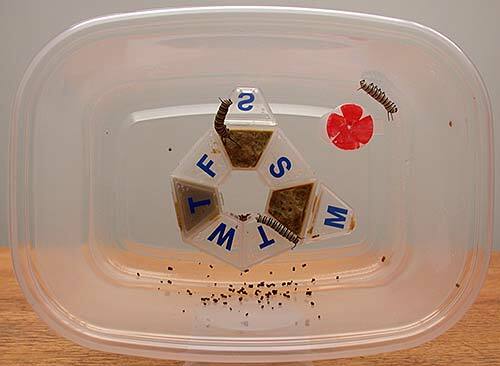 The front of the chamber should be clear plastic or plastic wrap so that students can view what the caterpillars are doing inside the chamber. If you use plastic wrap, be sure to punch a few small holes to provide for air passage and to minimize condensation. The plastic wrap works well if held in place with a rubberband, since the tension of the rubber-band allows you to pull on the plastic wrap to make a clear viewing window. Alternatively, you can have an opaque cover that can be opened for viewing when needed. Monarch caterpillars are slow moving and will stay on the diet but you don’t want a completely open front or the diet will spoil and dry out too quickly. 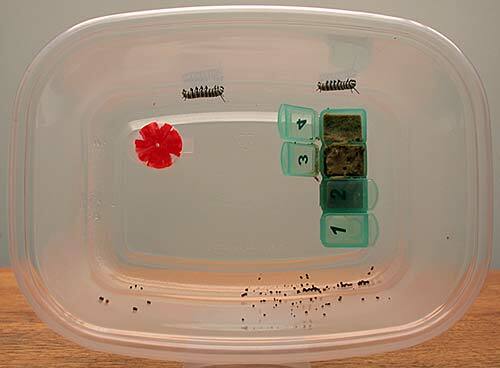 The nectar feeder should be placed within an inch of the top of the container and to the right of the diet feeders (Figure 3). As you can see, it is easy to make these chambers. 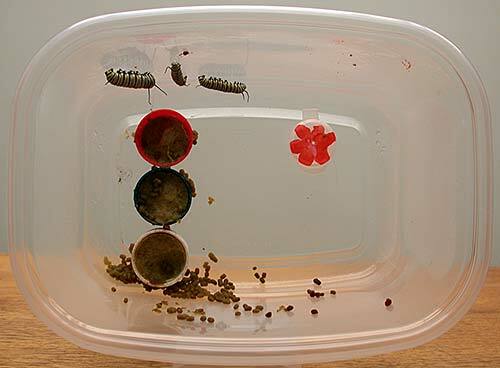 The only materials you need are a glue gun or double stick tape, a plastic container, feeding trays for the diet, some rough material to glue to the top of the container, a red marking pen to create a "flower" on the feeder, possibly some plastic wrap, and a cotton ball with some Gatorade to use as the nectar.